With the benefits of developing muscle while improving your flexibility, balance, and range of motion, and not to mention all the celebrity endorsements, it’s no wonder that ballet-inspired workouts are hitting the fitness scene in full force. With the help of Paulina Witkowski and Barreworks, these 5 ballet-inspired moves will help lift, lengthen, and tone your entire body all in the comfort of your own home. All you need to find your inner ballerina is a countertop or a sturdy table or chair – tutu optional. Stand with your feet wide in second position (feet wide apart, balls of feet pointing outwards externally rotated from the hips), legs straight, and hands gently resting on the back of the chair. With your spine tall and abs tight Plié squatting down by bending your knees directly above your heels (do not bend knees over toes). Straighten your legs (squeezing inner thighs and glutes). Repeat 20 times total. Stand tall with your right hand resting on a table, counter, or the back of the chair. Engage your abs and lift your left leg out to the side of your body as high as you can, keeping your spine long and straight, and your knees and toes facing front (not up to the roof). Raise your left arm out to the side, into second position with your elbow slightly bent and palm facing front. Perform 20 pulses of the leg, engaging the glutes and lifting it up to the roof. For extra credit consider completing small circles with the leg moving it 5 rotations forward and 5 rotations backwards. For an even greater challenge, keep the leg raised as high as possible, and bend the knee hinging the heel towards the glutes. Repeat on right leg. Stand tall with both hands resting on a table, counter, or the back of the chair. Engage your abs and lift your right knee in front of your body as high as you can, keeping your leg parallel, toes pointed with foot below the knee, and spine straight and tall. Step the right leg behind the body, keeping the heel raised into a lunge position. The right shoulder, hip, and knee should be in a vertical line as you keep the spine tall and long. Lift the right knee returning to the starting parallel attitude position. Repeat the entire sequence 10 times total before switching to the left leg. Standing in parallel position, press toes into the floor and raise heels off the floor as high as possible. Keep the core engaged, and spine tall and straight. Repeat 20 times total. Hinge forward at the waist, keeping both hands on the chair and slide (or as Paulina directs “lick”) the right foot along the floor and lifting the right leg with bent knee behind the body. Lift the right knee returning to the starting parallel attitude position. Repeat the entire sequence 10 times total before switching to the left leg. 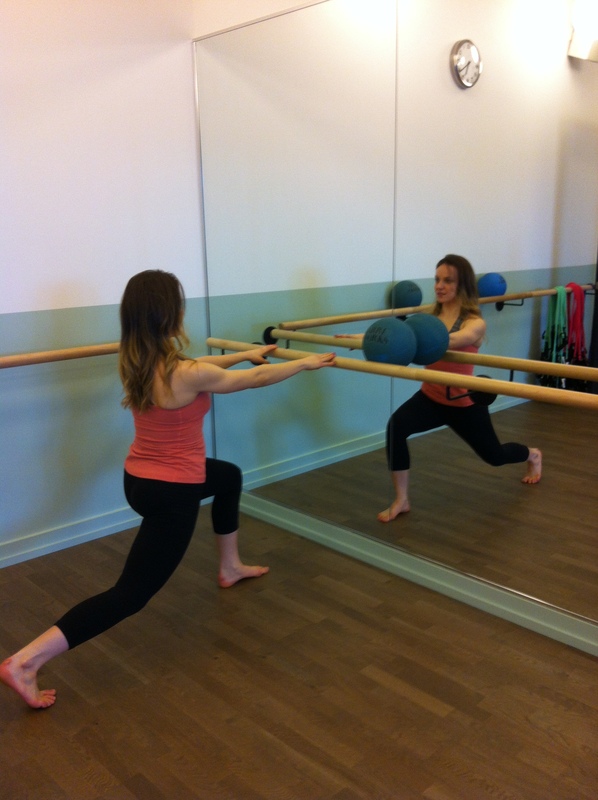 Ready to move your barre from home to the studio? 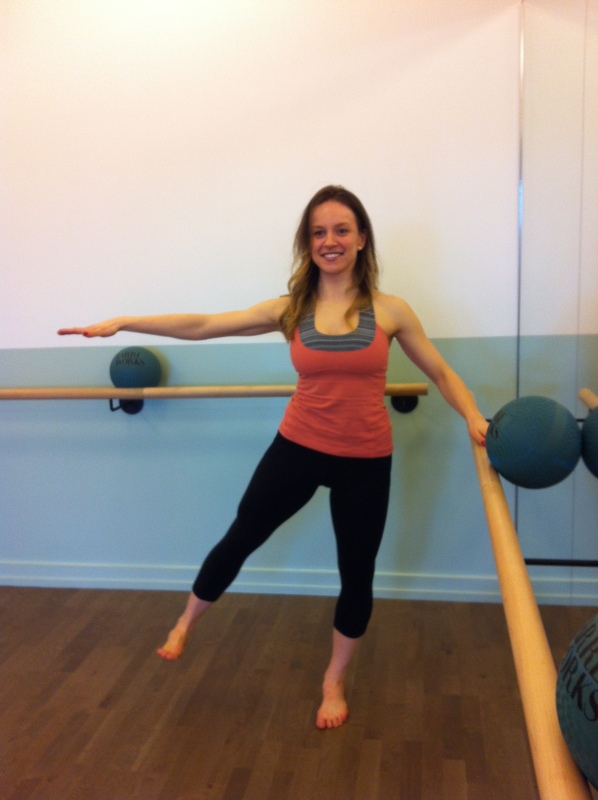 Check out my studio review of Barreworks here! Catch us Tuesday March 12 at 9:15am as we share this sequence on CH Morning Live. View it here!